Villas Key Features. Amazing Seaview’s, High Speed WIFI, Heated Pool Chlorine Free , Outside Sports Karaoke Bar includes a full Alfresco Kitchen & Dinning Area. American Pool Table, Disney Water Fall, Safe Shaded Children’s Playground themed on The Pirates Of The Caribbean movies, Baby Changing Station, Luxury Spa with Gym, Sauna, Hydro Hot tub, 3 Sunbathing Terraces, Shaded Seating Areas, Outside Cinema, AC Throughout, Full Sky TV, 5 Deluxe bedrooms, Luxury Linen & Towels, Sleeps 10, 4 Bathrooms, Designer Italian Kitchen, Open Plan Lounge, 60” outside TV for Sports Fans. We provide our guest with a wide range of games at the villa from Golf Putting Pro, Swing Ball, Basket Ball, air hockey, Foosball, and more to make your family’s stay a fab Holiday. 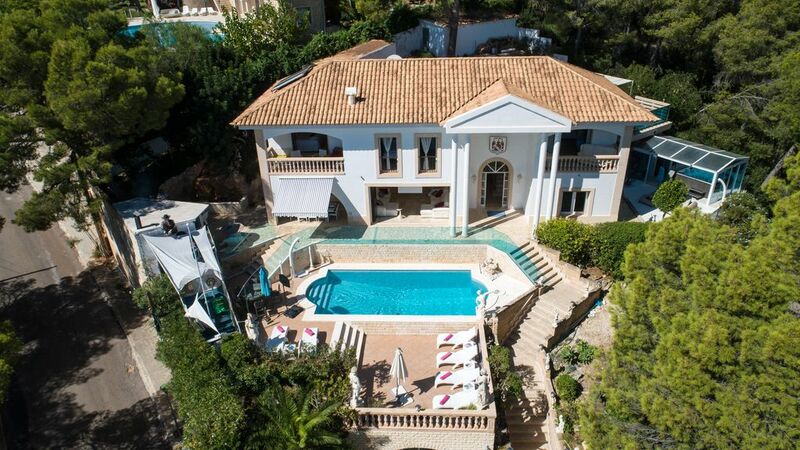 Your opportunity to experience the delights of this Designer luxury Mallorca Villa that is a favourite Holiday Rental for many celebrities that have spent their Vacations staying at the villa and visiting the famous Marine Puerto Portals and village of Portals Nous. Experiencing the Michelin star restaurants and lively bars that the Marina and Village offer. Guests at Villa Ocean View can experience the outstanding facilities on offer Sleeping 10 guests in emperor and super king size beds with the highest quality Egyptian cotton beds and 2 single bunk beds, 3 designer inside bathrooms and 2 outside showers. The High specification Italian pedini kitchen which leads out to the Alfresco eating area caters for private dinner parties, while enjoying the adjacent outside Ocean Sports Bar with IPTV TV, Kareoke, Barbeque, Plancha, chilled filtered drinking water, Pool table, fusball and waterfall. The Large Lounge has been designed to enable guests to enjoy the Celling surround sound cinema TV with full SKY package, that can be hidden away and open fully the glass wall to have beautiful Ocean Views over the Mediterranean. A sonos music system is installed to allow guests to play their favourite music of their own smart phone and players. White leather sofas and white leather dining table add to the relaxed comfortable atmosphere. Ocean Spa and Swimming Pool have been created to provide the guest Chlorine Free Bathing. A gymnasium is available for those who like to keep in trim while on holiday, which after a workout you can take a sauna or just chill out in the 8 seater Hydropool American Hot Tub, see the stars at night though the clear view roof and listen to your favourite sounds leads out on to the private luxury Spa deck with the fantastic designer sunloungers and your choice of streaming music . The Upper Chill Out Ibiza Deck with outside TV, Bar and seating area lets you take advantage of one of the most spectacular evening views over Palma bay in Majorca. The outside area provides 12 sun beds and seating for 20 persons. We do not Accept bookings from single groups, Hen Or Stag Parties unless agreed in writing with the owners. Working with our villa managment team offering guest a full support service and every year improving the faculties at Villa Ocean View. We have developed a unique vacation offering for family’s to get the most out of their holiday in Mallorca. Villa Ocean View is a favourite vacation destination for celebrity guests, and with the privacy and security at the property, it’s easy to see why. Portals Nous is a luxurious part of Mallorca, home to Marine Puerto Portals, exclusive shopping and fine dining. All of this is easy to reach from Villa Ocean View, which makes a stay in our beautifully furnished villa all the more appealing. For a number of years we have been welcoming guests and with our professional management team doing all they can to provide our guest with the ultimate holiday experience. Villa Ocean View offers unique outside entertainment and relaxing areas, the smart hub of the house offers guest the connections that are required for today’s Holidays with High Speed Internet Fibre Optic Speeds. The in house entertainment for all ages also helps guest get the most out of their vacation. In the morning walk to the Village of Portals Nous to sample great food and coffee. On Arrival guest are provided with welcome pack that includes the local Newspaper for their nationality, and our concierge team are there to take you on a personal guide of this high end luxury villa. Beach . Bath and Hand towel provided for each guest. Professional gymnasium includes a rowing machine, free weights and machines leading to Spa with sauna and american 8 seater Hydro pool hot tub with Spa Deck with sunbathing area. dress up box and pirate play toys pool inflatables. The local golfing course is Royal Bendinat, a 5 minute drive away. Day speed boat for water sports are available through local firm. Beaches are just behind the village. Please enquire for further information. Notes on accommodation: Great place for all ages and families . Games such as a football table , Basketball, and x box, kareokee machine with mics, 3-D TV surround sound cinema room Pool games woods for walking to the rear of the property very private location. Outside: Large white table & 8 chairs for outside dining, Outside Bar with traditional barbeque and also Gas BBQ, 6 stylish bar stool, & outside cooler. Swimming pool area is 4 large white loungers with cooler table unit, one large round table with 6 chairs and two umbrella's, Ocean view deck bar there is seating area for at least 10 people and another two sun loungers, Outside 50 inch plasma. Utility Room: Washing machine, dryer. Other: The sunbathing areas have modern comfortable sun beds and patio furniture to help guest get the most for their relaxing days in the sun with showers. The Villa was exactly like the pictures showed. High tech with the services and luxury we were looking for. The location was perfect easy walk to the village and the beach and very quite neighbourhood with great walks in the forest behind overlooking Palma Bay. Lovely villa , very modern kitchen bathrooms and facilities , Kay was very welcoming and helpful . It was a fun place to stay good position for portal Nous easy walk down a few sets of stairs, and within reach for Puerto portals and only €4/5 ride home in taxi . We played pool used the hydrotherapy pool a lot it was lovely and clean as was the property when we arrived . The pirate ship would be great fun for people that have smaller children and even for some that don’t 😄� we’re going to book for next year and take all our children who are 28/21/20&16 they will have lots to do here and the gym , sauna and pool etc are all an added pull with a grown up family and the good entertainment system and sonos. Lots of different seating areas so you can chill out and have space if you want it, kay asked for constructive feed back, there wasn’t much negative to say, being avid cooks there was 1 or 2 small kitchen items that I would have liked but we told Kay and I know when we go back they will be there , along with an extra bath mat or 2! All in all a great holiday definitely going back. Thank you Tim for your generous review, we work hard to ensure all our guest have the best time possible at Villa Ocean View especially Kaye as the Villa is her pride and joy and she continually works hard to achieve the high standers we offer guest. The bath matts are already in place and we will be over the next week adding the Kitchen extras you recommended. We look forward to hosting your family next year at the villa. Thank you for your custom. Only 20 minutes drive from the airport . Just up the road from Portals Boutique Hotel. 10 mins easy walk to the local village of portals nous and only 5 minutes drive to shops and restaurants etc. Booking Notes: Extra fees to be invluded are £1 per adult per day to be included on price. Pool heating additional 250 euros per week Changeover Day: Please enquire. Notes on prices: Discounts for short /long term summer/winter lets. Christmas/New Year £3500.